Today, I am pleased to have one of the Great Thoughts’ BFF’s join us sharing her Summer of Reading. Here is Jen from www.whenpigsflyblog.com. Jen is one of my favorite writers/humorists. You will see why I adore her writing when you get to Honey Boo Boo in paragraph 1. Normally, I split my time between writing and reading. I scour the Internet for the ridiculous, the relevant and sometimes find the newsworthy. It helps put the social in the commentary on my blog and fuel my particular brand of sarcasm. Believe me, it’s not tough to spin a little sharp edged humor when the likes of Honey Boo Boo are taking up space in our mainstream collective consciousness. The problem is that too much of anything is never good. It doesn’t matter if it’s political hyperbole in the Op Ed pages of the New York Times or celebrity fluff pieces in Us Magazine. Overload is overload. I, for one, needed a break from the online life. A couple of months ago, I did just that. I started reading actual books again. Anything and everything I could get my hands on (or, shall I say, my Kindle on.) It felt good this kind of reading. It didn’t involve sound bites and there was no commentary from the peanut gallery. It was just me and whatever little world I had decided to inhabit for the better part of a few hundred pages. As Andrea has asked me to write a guest post and pull my nose out from a book, I thought the best way to help her out was by sharing the favorite of my summer finds. Here are a few of the books that have kept me occupied and away from writing recently. I’m hoping you find that at least one of them can give you a respite from whatever you need to take a break from in your everyday life. This is the first Stephen King novel I’ve read and I couldn’t put it down. It’s about an unsuspecting high school English teacher that decides to try and stop the Kennedy assassination after finding a portal that takes him back in time several years before the event happens. If you want a total escape, this is the one to read. I’m a huge fan of writers who can create a series of essays worth reading. Depending on your taste, you may find David Foster Wallace either an unmitigated genius or a self-indulgent rambler. I’m of the first camp. My favorite essay in this book is an unabridged version of one he wrote for Rolling Stone Magazine about following John McCain for two weeks during his bid to become the Republican Presidential nominee against George Bush in 2000. It strikes just the right balance between cynicism and sympathy for a political process that not even the media enjoys following any longer. I stumbled across this book after realizing that the author and the fictional Aunt Lola are one in the same. This is a story about a woman during two periods in her life, at age 21 living in Mexico and much later as a married woman coming to terms with her impending death and husband’s infidelity. There is betrayal tragedy and coming to terms with the consequences of being young and naive. It ends with a bang. This book was written by one of the funny people I follow on Twitter. He posted something about it and I went on Amazon to check it out. Who says social networking doesn’t work? Mercury Falls is a very funny, satirical take on the Apocalypse, cults and angels hanging out among us. I know it sounds crazy but fiction about the end of days can be hilarious. Here’s another one that leans toward the comedic end of the spectrum. It’s about helicopter parenting, unrealized dreams, mother-daughter bonds and figuring out whatever any of us needs to keep ourselves fulfilled. It’s witty, engaging and an interesting ride. Grab a skinny latte, a fat free muffin and hide yourself away with a good book. Your soul will thank you. Now go read Jen’s work at When Pigs Fly. I was thrilled to write something for you! Hope your readers enjoy the recommendations. I don’t have a Kindle, although it would probably make more sense, seeing as I’m always too cheap to buy new books right when they come out (yay used book section of the store!) However, I’ve taken a couple of your recommendations in the past and bought the real books and loved them, so I’m certainly adding a couple of these to my (overflowing) Amazon cart/wish list. I think all of these are in paperback now. So, go buy a couple. One of these days it’s going to get chilly and it will be perfect for curling up with a good book by the fire. Thanks for the recommendations! I’m going to check some of these out for sure. So glad you stopped by here. 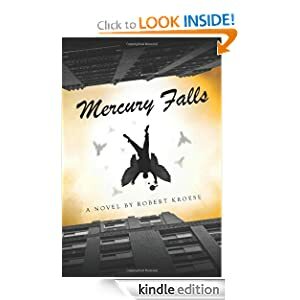 All the books are good but if you want a good story that will make you laugh, try Mercury Falls. What a great post–thanks for sharing! There’s nothing I like more as a reader (and as a writer) than when funny, smart people share their to-read lists. I’d been considering picking up the David Foster Wallace work, and now I will! Funny and Smart. Thanks for lumping me in with those adjectives! I truly enjoyed the DFW essays. It’s definitely worth picking up. Thanks for the suggestions – I’m going to check out Where’d You Go, Bernadette? Also – LOVE your blog Jen! Thanks so much. I think you’ll enjoy that one. Yup…she’s one of mine too! I’ve been reading her blog for YEARS! Great guest post, Jen! And I’m going to check out 11/22/63 because it sounds so interesting. Plus, I love anything Stephen King. I truly need to get back to reading again. While on vacation in July, I actually read TWO books by Nora Ephron and was so proud of myself because it had probably been like TEN years since I read an actual BOOK. Again, great post and thanks for sharing these recommendations, girl! The Stephen King book is a complete page turner. The last person I passed it on too can’t put it down. I think you’d love it. I’ve had that Stephen King book on my list for a while now. Time to give it a go! Good post, Jen. I read and loved “Bernadette” and am going to take your recommendation on the DFW book and Mercury Falls. I’m very into memoir, too, especially by writers. Currently, reading Fay Weldon’s memoir, “Auto da Fay.” Glad you’ll be back blogging more again, soon. I just subscribed so I won’t miss a post. I think I might have to download that last one. It sounds terrific. Bernadette just arrived for me yesterday. Can’t wait to read it! Good choices. Am reading Where’d You Go Bernadette right now and enjoying it… The Stephen King one is up next!